Carry on luggage is very essential to bring important personal things or professional items during traveling. So, it important to pick a right carry on to travel comfortably. We review here the highest quality carry on luggage. All of them are lightweight, durable and extremely comfortable. We bring here all necessary information, including size and weight requirements, liquid and gel restrictions and other guidelines about the best carry on luggage. Read our full reviews below, make sure you checked everything you need. You can also read our guide on best luggage. 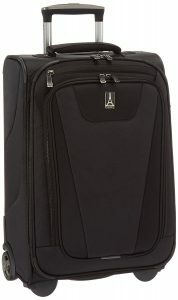 The Rockland Melbourne carry on luggage is for the frequent business travelers. 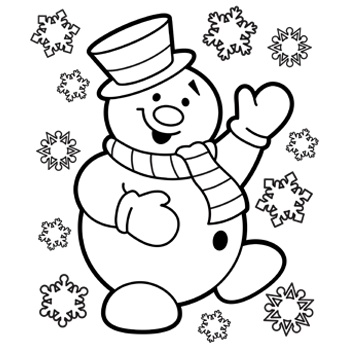 Its appearance has a very professional yet casual look to it. They are of the expandable type for when you need the extra space. Not only do it look great, but the Rockland Melbourne is durable and comfortable. Every model is made out of extremely durable ABS material, and it feels soft but is a strong and durable material. It features a four wheel system in which allows effortless maneuverability, whether pushing or pulling. The Samsonite Silhouette Sphere is very well designed, spacious and fits in the overhead bins perfectly. This carry on luggage is the expandable type, and it able to fit up to 5 days worth of content for trips. The Samsonite Silhouette Sphere also comes with a laundry bag for your dirty clothes or as a day pack to carry snacks and other items. The clear pouch was also useful for carry on liquids. The Samsonite Silhouette Sphere carry on luggage is very easy to navigate through the airports. A true 360-degree spinner and easy to roll. Pushing or pulling requires little to no effort and that it fit through the airplane aisle without bumping the passengers sitting. 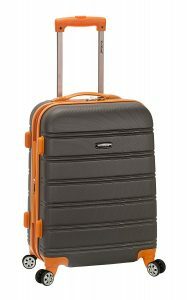 The Samsonite Silhouette Sphere 21″ carry on luggage is that it’s very stylish. Specifically if opting for the cypress green color, you truly get a unique piece of luggage. This was beneficial for those who like to check in their luggage as they are extremely easy to detect during baggage claim. We feel that this product deserves our recommendation. 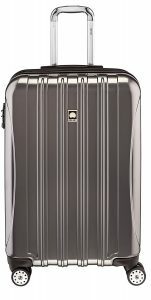 Anyone who is in need of a stylish, spacious, and easy to maneuver carry on for their trips, this luggage is for them. The Delsey Helium Aero is a lightweight and durable carry on luggage and it weighs only 12 lbs. It has four roller wheels those make it move well on all surfaces, carpets, asphalt, etc. It is expandable and it expands up to 2 inches in depth for any extra content you may accumulate while on vacation. It also features a detachable suiter that is perfect for business trip travelers. Keeps clothes wrinkle free. The suiter insert may be removed when not needed. The great price, tougher wheels, and durability makes up for its mostly questionable drawbacks. We recommend the Delsey Helium Aero as one of the best carry on luggage around. 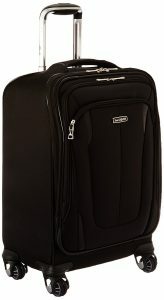 The Travelpro Maxlite is durable and very spacious for carry-on luggage. This carry on is expandable and is the maximum size for a carry on. The Travelpro company makes huge upgrade from the previous carry on luggage considering its durability and long life value. The product features a compartment for a suit and keeps it wrinkle free. The wheels function very well with little effort on any surface. It is very comfortable for taller travelers who in the past had difficulty finding a product with a long enough handle to reach. Not only is the Travelpro Maxlite dependable, spacious, and comfortable but also it is a popular well known and trusted brand that will last for many years. The company provides lifelong warranty for this carry on luggage. The American Tourister Star Wars carry on luggage offers the perfect balance between lightweight, durability, and functionality. It’s constructed of ABS material that is exceptionally resistant to abrasions, punctures, and tears combined with a lightweight frame. Fully featured split interior includes large mesh pocket on interior panel and cross straps. It holds a good amount of contents for up to 4 to 5 days. 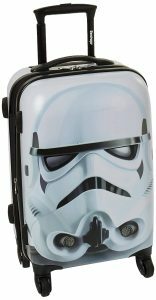 The American Tourister Star Wars is good for business trips and short vacations. It is very easy to maneuver. There are 4 multidirectional wheels, each move around a full 360 degrees. You feel no weight when rolling this piece of carry on luggage. We feel that this product deserves our recommendation. Anyone who is in need of a lightweight and durable carry on for their trips, this luggage is for them. This is our top list for best carry on luggage. All are superior in quality, lightweight, durable and extremely comfortable. It is now up to you which is suited for your journey.